For class last week, we went out to explore the landscape of memory surrounding the Independence Seaport Museum and the general Penn’s Landing area. What we found were a lot of lifeless monuments. I think one of the biggest themes with a lot of the monuments we saw was death. To be fair, as a historian focused on the 18th century, all the people I study are long dead. However, that fact is never in the forefront of my writing about them or a point I constantly bring up, whereas these monuments—the war monuments in particular—seemed very preoccupied with death. Museums often try to make their subjects alive and relatable to their audiences, and fill their exhibit space with lifelike replicas, period music, videos, and/or many other mediums conveying life and animation. These monuments, on the other hand, often conveyed stillness and quiet. The Korean War memorial, for example, was made of very still granite, in rectangular, not-at-all flowing shapes, with solemn black text. It felt very similar to a modern cemetery, almost as if they hired a headstone designer to create the monument. Like a cemetery, the names of the dead are inscribed in the stone. I also noticed, while walking around, that there were no monuments to older wars. There was no monument to the American Revolution, the 1812 War, the Mexican-American War, WWI—only monuments to fairly recent wars which still have survivors and surviving relatives of the dead. Philadelphia has other monuments, but this area seems devoted to more recent events only. These monuments are also completely out of the way, in a fairly desolate area for foot and vehicle traffic. I initially thought this might just be poor city planning or coincidence related to the construction of I-95, but now I think it might have been intentional to promote the feeling of stillness and somberness reminiscent of a cemetery. The monument to Revolutionary War soldiers in Washington Square is surrounded by people using the park, but no one alive uses the monument as a cemetery. Why would they? No one alive knew any of those soldiers. The Korean War monument, however, can be used as a cemetery—veterans who lost a friend in combat and relatives who lost family members can go there to remember their lost ones and try to move on. The monument also attempts to provide meaning for their deaths, with various phrases about the price of freedom and even a short history of the Korean War. We visited just after Veteran’s Day, so there was evidence of recent activity at the monuments in the form of flags and wreaths often left by veterans groups, suggesting these places are also used as gathering areas for communal remembrance of the dead. Anyway, to bring some of these rambling thoughts together, it seems to me that many monuments are constructed to help survivors and relatives deal with early deaths, which often result from tragedies such as wars, terrorism (for example, the flight 93 and various 9/11 memorials), shootings, etc. In the case of the Korean War memorial, and probably many other war memorials, the monument tries to explain the deaths and give them meaning. It is designed similarly to a cemetery and serves similar purposes, sometimes even as a stand in. ​One of our readings for this week was “The Architecture of Racial Segregation: The Challenges of Preserving the Problematical Past” by Robert Weyeneth. In it, Weyeneth examines various methods used by architects, designers, planners, businessmen and others to segregate and minimize contact between black and white Americans during the Jim Crow era. He categorizes each method and describes them in detail, drawing on extant buildings, their remains, oral histories, building plans, and other sources for his research. He also looks at how people negotiated and also subverted this landscape, and how they sometimes defied the scripts the architecture had written for them. He finishes by pondering if and how the few remaining sites of this architecture should be preserved. While I did not write about it in my last blog post, last week’s readings also discussed landscapes, both natural and cultural, and how they shaped interactions, as well as how different people interacted with them differently. One in particular focused on how slaves and masters interacted with plantation landscapes. While my wall gun has nothing to do with American landscapes or American slavery, it did fit into a very particular landscape of war. 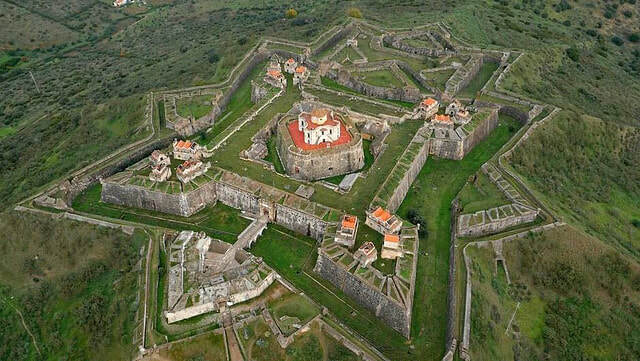 Its primary purpose was to rest on the walls of a fortification and provide superior, versatile long-range firepower to its user, filling the gap between infantry muskets and small cannon. 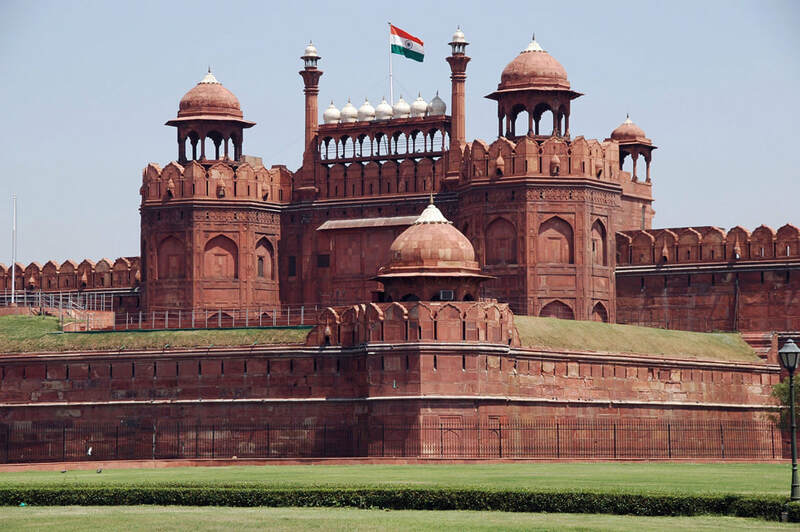 That use was specifically mediated by the architecture of fortification, and better understanding how the Mughal Empire constructed forts is crucial to better understanding the gun. Comparing the gun to European wall guns already shows significant cultural differences, as does comparing the Red Fort or Agra Fort to Fort Ticonderoga or any other star fort. 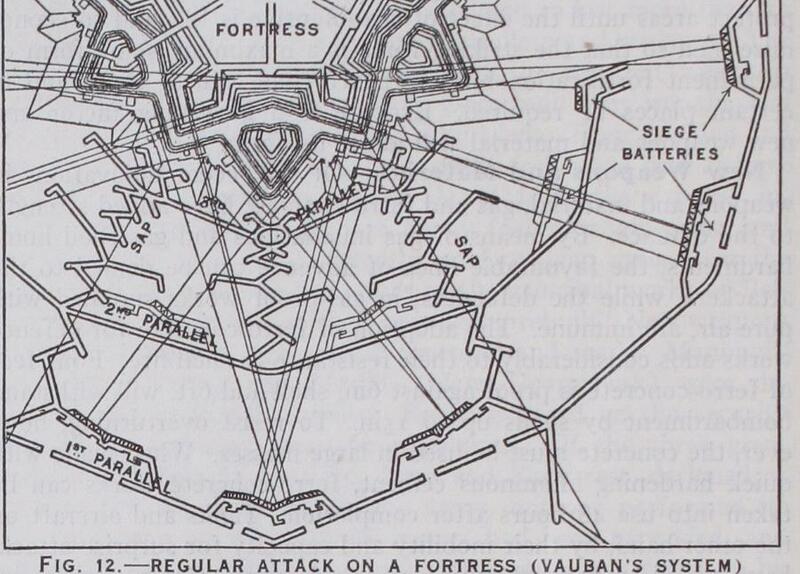 Like all other architecture, forts were designed to control people’s actions and movements—although in their case, it was to move them into channel them into kill zones so a small force could stand up to a much larger force. Star forts attempt to apply the science of geometry to do this most effectively, while the Red Fort, like this wall gun, sacrifices geometrical perfection for aesthetics and display, and, militarily speaking, simplicity in design and construction. Whether that is an intentional choice by Mughal leadership or simply the result of a different military tradition I don’t yet know. However, I will have to understand Mughal fortification—from permanent to temporary—in order to really understand the wall gun. World” by Ken Yellis. He returns to a theme he has covered before—controversy in museums. In this iteration he continues to explore how the unique medium of museum exhibits is still not fully understood by museum professionals, how museums are still extremely cautious about creating potentially controversial exhibits, and how museums should embrace controversy instead of running from fights with the public. He is concerned with revisiting the themes of his previous article, the Fred Wilson “Mining the Museum” exhibit and cliff swallows “Mixed Blessings” exhibit, but he also discusses a recent exhibit at the National Portrait Gallery called “Hide/Seek” which explores portrayal of gender in portraiture. While the gallery was prepared to create controversy about gender and defend its exhibit from that, it was not prepared to engage in a fight over use of religious symbols in art. When it got one, it then backed down in order to avoid the distraction from its main message. Making this more relevant to my object was the editor’s note at the beginning, which mentioned a recent protest of a UAV (aka drone) exhibit at the Air and Space Museum. Like UAVs, my wall gun is a weapon which was particularly effective at killing people. Unlike UAVs, it hasn’t been used in war for a very long time, and even when it was, it was used by an empire far from here that most Americans don’t know or care about. That makes it less controversial and easier to display, but also very hard to make relevant and useful to an American audience. Maybe in India it could be used to create the kind of risky, potentially controversial exhibit Yellis yearns for. But in America I’ll have to rely on guns used by Americans—and I think I have several ways to use them that might intrigue Yellis. See my thesis when it’s finished. ​This week’s readings include Igor Kopytoff’s essay, “The Cultural Biography of Things: Commoditization as a Process.” Kopytoff is primarily concerned to destroy the binary of commodities, arguing that things can’t be only divided into commodities and not commodities. Instead, he proposes that things fall somewhere between the two extremes, and often shift quite drastically between the two at various points in their existence. He also posits that Western culture has the unique distinction of decommodifying people and struggling to keep them that way in direct opposition to economic forces which push for ever expanding commoditization. He demonstrates this argument through the use of what he calls biographies of things. Much like the biographies of people, these begin with the object’s “birth,” and follow the object throughout its various uses in the various stages of its “life” until its eventual destruction. According to Kopytoff, these biographies can teach us much about the objects themselves but also about the cultures surrounding the objects. They also allow us to track the object’s slide to and from being a commodity or not. This idea provides an interesting new way to look at my wall gun. Tracing the commodification of my gun will require more research on its “life.” However, it has probably fluctuated a lot in its value as a commodity over time. I do not yet know how the Mughal army procured its weapons, but if it at all resembles the way contemporary Western armies procured their weapons, then the gun started life as a commodity, made by gunsmiths to be sold to the army. As a wall gun, it has no practical civilian application, and may have been made under contract for the government. In any case, it likely was a commodity with one specific buyer and user in mind—unless produced by the army at a state run arsenal, in which case all its component parts were commodities acquired by the government. Once under the army’s control, it would no longer be much of a commodity. While in service, the gun would be placed in an armory and stored until needed. It would be kept secure to prevent it from becoming a commodity by would-be thieves. It might earn a special name from the soldier operating it, who sees it as his loyal companion in warfare, intimately connected to his own survival. He might get attached to it as he cleans and maintains it, knowing his life depends on its reliability in combat. In Kopytoff’s language, this has pushed it away from being a commodity and instead singularized it, maybe even sacralized it too. However, once it became obsolete by advancements in military technology, the fall of the Mughal Empire, and the inroads of the British Empire it lost its monetary value, sliding further away from commodity. Perhaps it was preserved as a sacred object by a former soldier, leader, or commoner, or perhaps it lost its sacredness too and was abandoned in an armory or ruined fort. Whichever the case, it soon jumped across the commodity continuum when it was somehow rediscovered and traded or sold until it came to Theodore Newbold, who donated it to the ISM. At the museum it took back its sacredness as an antique, although misidentified as a punt gun. This error actually furthered its singularization since it fit perfectly into the ISM’s collection. My discovery of its actual identity as a punt gun has changed the trajectory of its “life” again, as it could potentially be deaccessioned from the museum. It may be commercialized and the profit used for preserving the rest of the ISM’s collection, or it may find a home at a more relevant collection at another museum, allowing it to remain relatively sacred and singular. Whatever happens, at the outset of this project I certainly did not expect to play a big role in the life of this gun. I hope it finds a home at a museum among other wall guns—because after all I am a product of my culture that has promoted its sacralization. ​One of our readings this week was Cary Carson’s essay “Material Culture History: The Scholarship Nobody Knows.” In it, he breaks the field down into four genres of scholarship, and briefly sketches the evolution of the field. However, in doing that, he argues there are some problems with the field and plenty of room for growth. Carson’s breakdown of the field and discussion of its weak points gave me some insight into new ways to think about my mysterious matchlock and also about civilian firearms in general. The first problem he raises with the first genre of material culture works is that object scholars often start with a collection of objects and study them rather than starting with a big question and seeking out objects as evidence. This made me think about what a punt gun could be used as evidence for, and there’s lots of possibilities. It is a working class firearm which could tell several social history stories about market hunters, a specialized regional firearm which could support a regional history or technological or industrial history, its ban could fit into a political history, its use fits in to economic history…I could go on. There are simply a lot of possibilities, which grow further when I start to think about hunting weapons more generally. Carson next discusses the theoretical works written by material culture scholars. However, he argues that they are derivative of theoretical works in other fields, and almost serve as no more than links to celebrity scholars. I’m not a big fan of worldview-defining theories and ideology, as they have many weaknesses, but they can be helpful if applied carefully. In the world of punt guns, and many other weapons, theories are especially hard to apply to objects, because there is an incredible amount of cultural and regional variation. Many firearms are designed to fit the terrain they’re being used in—punt guns only make sense in specific coastal environments—and many designed for universal use still have a lot of cultural differences for what is at heart a utilitarian object. However, neither of these were the most potent sections of Carson’s work for me. I was struck more by his recommendation for reaching the public. He essentially argues that since Americans live in such a vibrant material world, the best way to reach the American public is to connect historic objects to the basic struggle for human rights. By doing this, he argues, it becomes easy for us to find ways to translate objects into messages. This is a very helpful framework for looking at all kinds of firearms, which are intimately connected with rights, as they have been tools to gain and defend rights, tools to take and suppress rights, and the subject of a hotly contested debate about rights. However, hunting guns in particular have an even more immediate connection—they are intimately connected with the struggle to survive. They literally put food on the table. A punt gun allowed its owner to kill and sell ducks, and use that money to survive and make life more comfortable. The more effective it was meant the hunter could live more comfortably. The power of that connection for the audience might even make them empathize with the plight of the hunter once market hunting was banned. And that is the power of objects. Our next task in documenting Lesley is to document several related items. Each of us was given an object to study for the rest of the semester; I was assigned a firearm. However, despite my knowledge of historic firearms, this one immediately threw me off. Given the time period we are dealing with, I expected the gun to be a percussion lock or possibly a flintlock. However, I was immediately confounded by the absence of any obvious lock. A closer inspection and description was my next step anyway, but now it was made extra intriguing. Temporarily setting aside my curiosity about the lock, I began by taking some measurements. The most important measurements for firearms are caliber (the inside diameter of the barrel) and barrel length. However, this gun has sustained a lot of damage, and the end of the barrel had been broken off, so my measurement for barrel length is probably inaccurate and not helpful. However, what I could measure was 45.5". The way the barrel broke also made it difficult to get a measurement for caliber. Normally I would prefer using a caliper to take that measurement, but all I had was a ruler, so I made do. I measured 15/16", which is about .94 caliber. I also measured an overall length of 66". I also noted the materials: iron barrel and barrel bands, wooden stock. I also noted the matchlock styling influences on the stock and the rear sight. I also picked the weapon up and found it to be significantly heavier than most others, and extremely unbalanced. Clearly, it was not meant to be highly mobile or for field use. The Hudson Valley fowlers I had experience with were over 6' long and heavy, true, but they were balanced and much easier to carry, even if not very maneuverable. I tried getting into firing position with it, but it was far too unbalanced to hold steady, the stock was too long, and the recoil would be too much to handle. Obviously whoever used this fired from a rest or support of some kind. Next, I moved on to the firing mechanism. On early European and American firearms, the lock, stock, and barrel were typically made separately, sometimes by different gunsmiths, and then assembled later (with some exceptions such as boxlock pistols). This means the lock was removable and usually attached on the right side by screws going through the stock to the sideplate on the left side. This obviously wasn't the case with this gun. Before I took a closer look, I first thought this might be a more modern weapon, like a modern shotgun which opens at the breech and has an internal action (approximately the modern term for lock). However, upon taking a closer look, the gun unmistakably had a matchlock of a type I hadn't seen before. Matchlocks were the earliest and simplest of all the locks, holding a lit slowmatch which, when you press the trigger, descends to light the powder that will fire the gun. They were both unreliable and dangerous. The trigger on this gun had no trigger guard and was operated by pulling up on it, as is typical for most matchlocks. However, instead of the lock being attached to the outside, it is integrated into the stock. As best I could tell without taking it apart, the trigger is simply connected to a bar that is connected to the serpentine (the part which holds the match) so when you depress the trigger the serpentine and match go down and ignite the powder. While this was the visual evidence confronting my eyes, it still didn't make any sense why someone would be using a matchlock for market hunting in the 1800s, so I kept doubting myself and my conclusions so far. I went next to the museum's records on the firearm to see what they had to say. The record states the weapon is a punt gun, donated to the museum by Theodore Newbold in 1984. The record also listed a model of a punt gun in use on a small boat, as well as a photo of the boat and gun in use. This described punt guns as having a 2" bore (2.0 caliber), while the object in front of me wasn't even half that caliber. There was also a short description in some appraisal documents, listing the gun as an early wood and iron duck hunter's gun from the first half of the 19th century with an unusually short overall length of 65". The appraiser's qualifications were listed as a specialty in Chinese and oriental art. Beside this was a printed Wikipedia article on percussion locks. All of this was starting to make less and less sense; why would there be an article about percussion locks in the record for a matchlock? Why would the gun be so unusually short, and with a much smaller caliber than expected? Why would anyone be using a matchlock to hunt ducks in the 1800s? 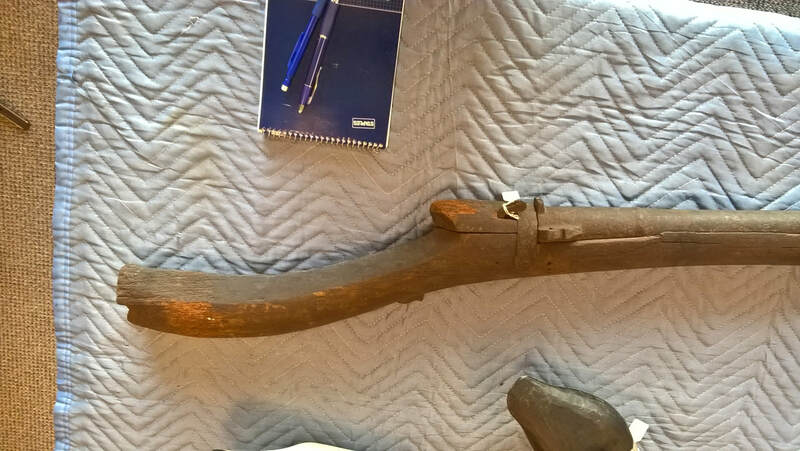 I began to think this matchlock might be an early punt gun, and not the 1800s 2 caliber 7' (or longer) percussion lock punt gun I was seeing described by the record. I also considered the gun might have been passed down from hunter to hunter. It gave me a lot to think about after class. Hello and welcome to my Material Culture blog! Our first exercise for this class was to spend an hour with an object we will become quite familiar with over the semester--an usual type of sneakbox boat designed for leisure. This one has been named the Lesley, after the donor who gave it to the Independence Seaport Museum. For my hour of looking and seeing (and drawing), I chose to examine the fuel and engine system. Immediately upon approaching the boat, I noticed what looked like a fuel cap, and when I took a closer look, my suspicions were confirmed--it read GAS. So I drew it. Some questions sprang immediately to mind: how do you open this? Some type of tool that fits in the two holes? Where does it lead to? Is there a tank? An engine? To start investigating this, I immediately scanned the Lesley for evidence of a fuel system I discovered two fuel tanks, on either side of the boat, directly under the gas caps. Attached to one of them was a fuel line that led to the center of Lesley but did not connect to anything. This raised more questions: what did the fuel line power? I speculated it was probably for some type of onboard engine, although I could see no immediate evidence (besides the fuel system) of the engine or what it powered. I noted that parts of the fuel system were now green in color, and wondered if they were made of some type of copper alloy, and that the fuel tanks were grey and covered in various degrees of rust. I also noticed looking at the tanks that they were roughly the same size and shape, but one had additional attachments on the head of the drum while the other did not. Why would they be different? After making notes on these, I proceeded to look for more evidence of a former engine. I could find no propellers or engine mounts or much of anything, but I did find an odd screw connection which led to a hole through the hull. Perhaps this was some kind of exhaust port for the engine, or maybe it fit another component. At this point, I felt I would find no more evidence and instead began speculating the purpose of the engine. 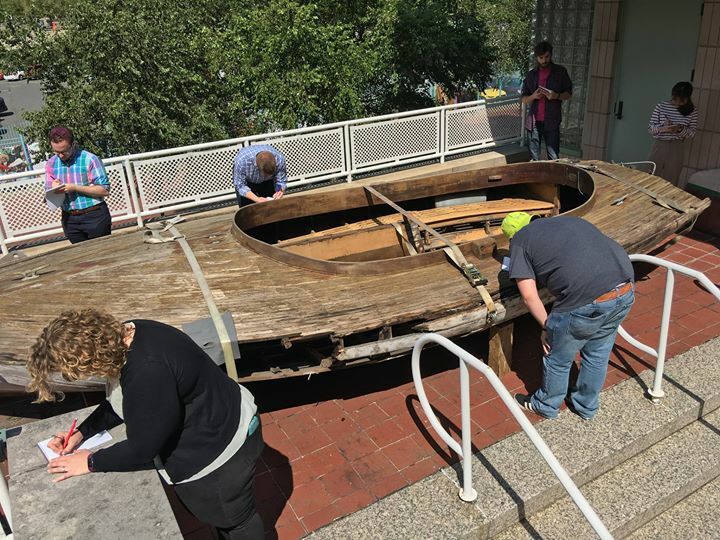 Since it was obvious the boat had masts and sails, it did not seem likely the engine was the primary system of propulsion. I figured it was probably for slow speed and close quarters movement into and out of docks and small spaces, especially because it is very hard to maneuver by sail in those areas. I started walking around the boat again, and then noticed something else which could be evidence of the engine. What I found were several pieces of wood in the bottom of the boat which had various holes and cuts where engine and drivetrain components could have been. It is obvious something ran through them, and the first had odd cuts which could have been part of the engine mounting system. My theory is the center holes may have held the driveshaft or similar component, while the other two carried some type of exhaust system. Or maybe it's the inverse, with the exhaust running through the center in a system with two propellers. Unfortunately the Lesley is too unstable for me to climb in and try to see how the holes line up to investigate further. 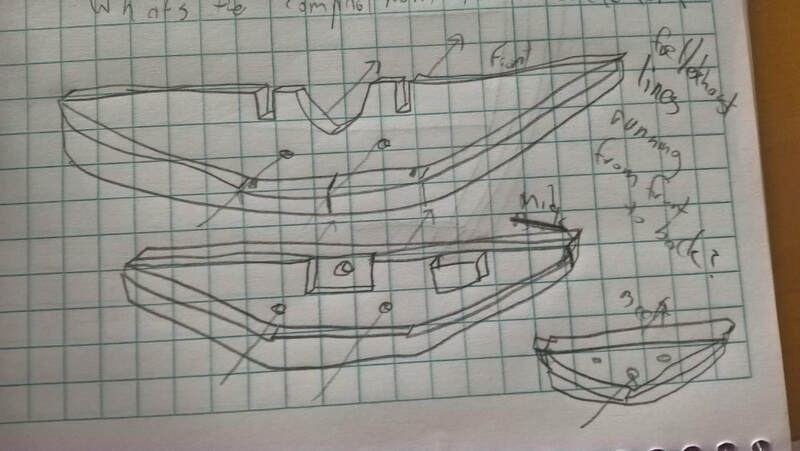 General research on 1930s boat engine design will help clarify things for me.